Caveat:- The following advice is provided by the author as a GUIDE based on ownership, involvement with and reports from other Deauville Owners, both in the UK and around the world. The author accepts no liability for actions taken by others after reading the following content. 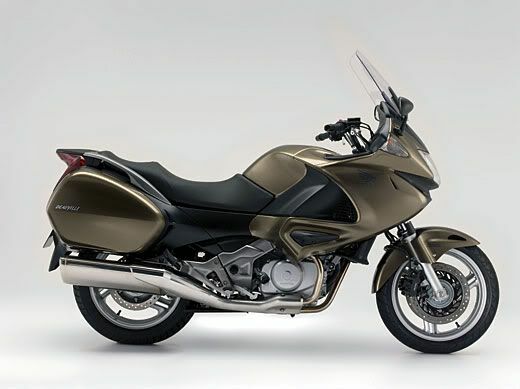 Neither does the author wish to imply that the Deauville model is any more or less reliable, of better or worse build quality than any other model of motorcycle produced by any manufacturer (past, present or future). So I am going to focus on the specific, known and documented issues that could help you distinguish a good Deauville from one that is possibly past it's best or could land you with a hefty bill to put right. Things that the seller might not want you to discover and which could possibly be the reason that the bike is up for sale. Remember "caveat emptor" - buyer beware. Not everybody is an "honest John" and many look to off-load their troubles onto others and think that it is fair game to do so, so make ALL your checks before parting with your money - it's easier to keep it than it is to get it back. It is also worth remembering that the Deauville was first released in 1998, so early examples are now over ten years old and while low mileage examples continue to surface, most will/should have 45,000-50,000 miles under their wheels. First decide and be sure on the nature of the bike you are looking for. If you just want a "winter hack" then you probably won't want one in prime condition. The same applies if you are looking for a project bike. Buyers of these type of bikes will probably accept a rougher looking example in order to save money. But if you are looking for a genuine, low mileage, machine that you intend to care for and keep for a while with minimum fiscal and actual inconvenience, then you will want to be able to identify and buy a Deauville that will give you less hastle from one that will be more demanding. Having decided what type of buyer you are and what you are looking for, then next comes condition. A good clean Deauville is more likely to have been cared for, so a rough looking one could indicate neglect. Deauvilles hide mileage very well if cared for so don't be put off by high mileage on a bike that's obviously been looked after. The early bikes were a favourite with motorcycle couriers (and still are) and it's not unheard of for these bikes to go on for in excess of 230,000 miles and I am aware of one owner buying a Deauville with 98,000 miles on the odometer only to find that it had actually done in excess of 200,000 miles. Like I said earlier "caveat emptor" - buyer beware. Damaged plastics - these can be expensive to replace. It is often cheaper to repair and repaint the bust panels, but, still not cheap and it will be time consuming whether you have the skills or have to get it done professionally. 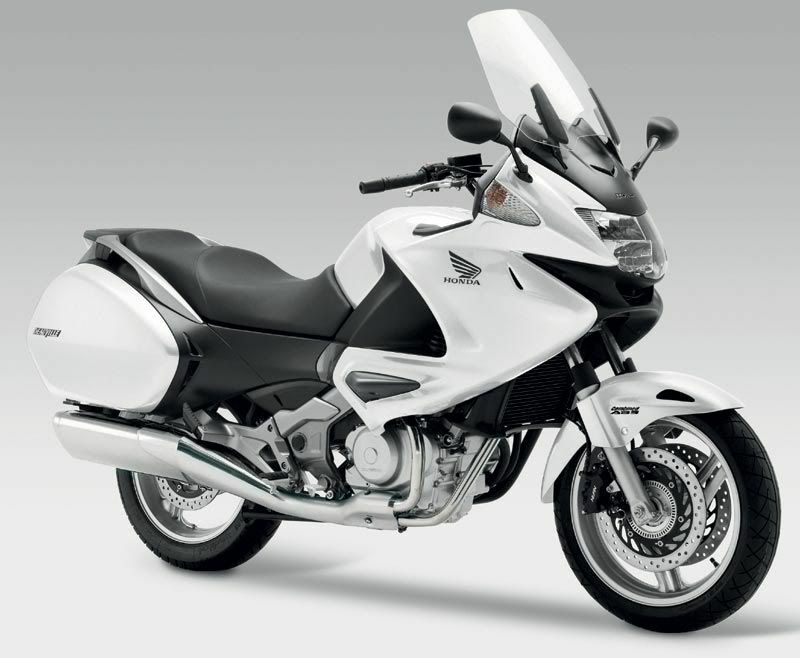 While checking the bodywork, make sure the panniers open and close easily, if they don't it may be a quick DIY adjustment (650), or, a visit to the dealer (700). Corrosion - is probably the biggest issue to look for on the Deauville. Muck thrown up from the front wheel does it's best to destroy the front of the engine, the down tube from the head stock, front engine mount, lower radiator and water pump. While muck thrown up from the rear wheel removes the paint from the swing arm and lower rear suspension mount. Water pump - on all 650 models the rubber pipe from the pump to the radiator connects to a stainless steel pipe that enters the water pump housing which is made of alloy. Stainless steel connecting to alloy causes an expanding corrosion and because the alloy is weakest it cracks, resulting in a water leak from the pump. Simple spannering but expensive to repair. Brakes - pre-2002 had Brembo brakes which can be prone to sticking but are simple to strip, clean and make serviceable again. These brakes are reknown for being "sharp" in use so bear that in mind on a test ride. Brakes - 2002-2005 bikes had combined / linked Nissan brakes and while the front have 3 pistons where the earlier Brembos had only two, the extra piston is the one activated by the foot brake pedal which traditionally activates only the rear brake. Nissan brakes tend to have a more wooden feel on the hand operated brake lever. Fuel pump - the 650 is fitted with a fuel pump that is known to fail with use over time. This can only be detected by attempting to ride the bike using ONLY the reserve portion of the tank. If the bike runs on reserve the pump is working, if not, then it isn't. Running on main tank fuel proves nothing as the gravity feed is sufficient for the motor. Battery - if the engine turns over slowly and it's reluctant to start this could indicate a dying battery. The Deauville will quickly kill an battery that is not in tip top condition. Recommended replacement is the YTZ14S at a cost of between £50 - £65 and is a DIY job. Exhaust - while the down pipes from the cylinders are made of stailess steel, the exhaust cans are made of mild steel (which rots) with chrome covers. In the event of an accident or the bike being dropped on the r/h/s the exhaust usually gets scuffed marking the chrome, however, the chrome bits are not available seperately. Standard replacements are very expensive and owners frequently fit Motad replacement syatems as these are fully stainless, and if you are competent with the spanners it is a DIY job. Lower suspension mount - the lower suspension mount on both the 650 and 700 is exposed to muck off the rear wheel due to a gap above the swing arm pivot and the bottom of the leading edge of the rear mudguard. Over time, exposure can result in this lower pivot mount corroding and seizing up. Visual inspection and a test ride may reveal the problem. Caring owners fit extensions to the leading edge of the rear mudguard, or remove the rear suspension unit and fit it inside an inner tube (both work effectively provided the problem has been addressed - i.e. cleaned up and both the bush and bolt replaced). Steering head bearings - the steering head bearings on both the 650 and 700 can show signs of wear at as early as 8,000 miles. The problem is down to two things, both production line/quality control issues. Insufficient grease being applied to the bearings in the headstock on assembly and/or the lock nuts on the steering stem not being correctly torqued together on assembly. The fault will manifest itself as a clunk felt through the handlebars on braking. If addressed early enough then disassembly, greasing and reassembly is all that will be required. If not sorted out in the early stages, then both bearings (top and bottom of the steering stem in both the upper and lower steering yokes) will have to be replaced. If replacement is necessary then tapered bearings are recommended. Water in dashboard - this problem has only been reported by NT700 owners and Honda will sort it out under warranty. Basically, water gets into the instrument panel and causes the instruments to misfunction, so if you spot this on a test ride get the owner to have a Honda dealer to get it sorted before you buy. 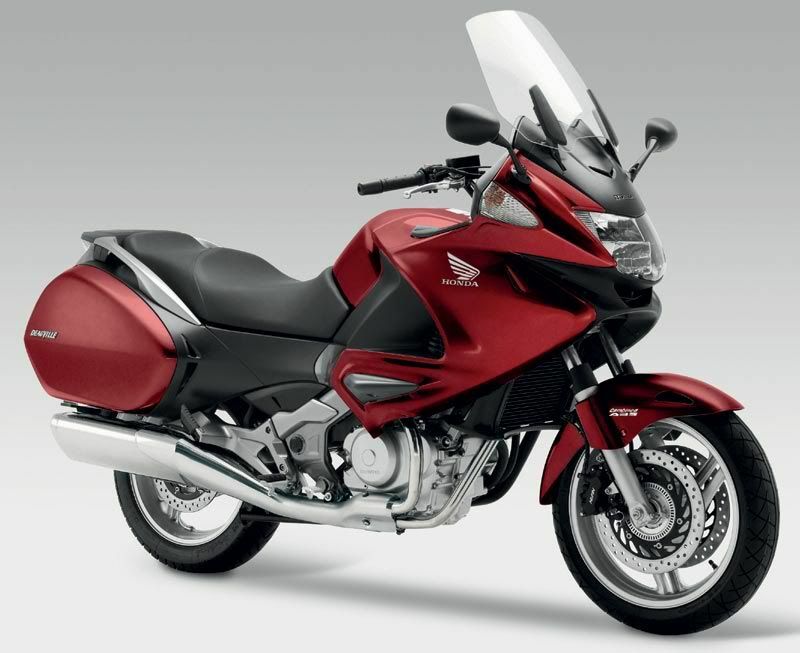 If you don't spot it until after you've bought the Deauville, then get down to your local Honda dealer. Noisy shaft drive - again, this problem has only been reported by NT700 owners. It appears to have only affected a few of the early 2006 bikes and Honda sorted those out under warranty. You will be looking for a whining noise while riding that simply isn't there at standstill with engine running. 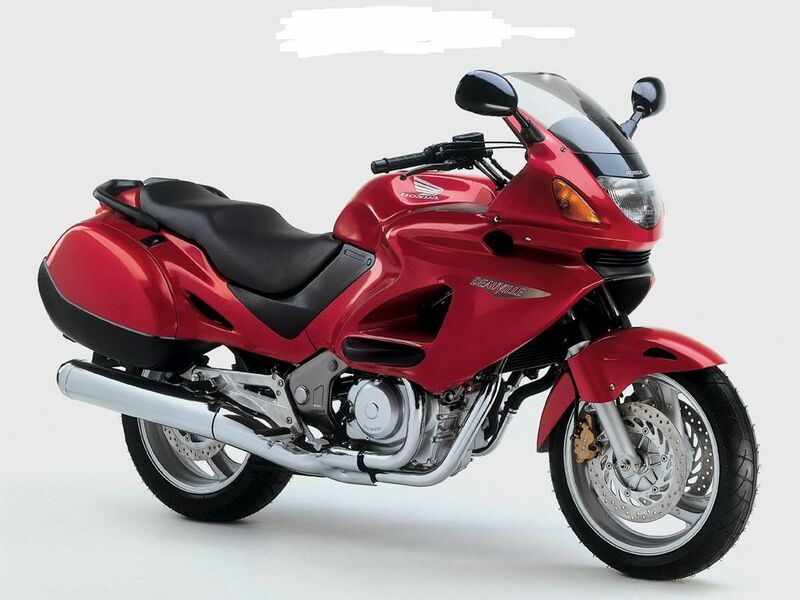 If you are thinking of buying one then bargain hard or get it fixed and a follow-up test ride arranged to confirm that the work has been done to your liking BEFORE you part with your money. You are going to take a test ride, aren't you? If you are talking to a dealer/trader then it shouldn't be a problem. If it is a problem then are still going to deal with them - if they won't help you spend your money when buying a bike them what sort of service will you get once you've made your purchase? Engaging 1st gear - clutch action should be reasonably light, engaging gear will be accompanied by a clunk - that's normal. You will probably hear a "clutch rattle" when in neutral, that goes away when the clutch lever is pulled in. This is normal. Pulling away - should be smooth, no jerking or need to dip the clutch. Brakes - on pre-2002 bikes the Brembo brakes should be "sharp", possible to lock both front and back if you try hard enough. Brakes - on 2002-2005 bikes the combined/linked Nissan brakes may feel a bit more "wooden" and may require a good pull on the lever, but remember, the front brakes are linked to the foot brake. Fuel pump - remeber that on the 650 the only way to check that the fuel pump is working is by attempting to ride the bike using ONLY the reserve portion of the tank. Lower suspension mount - if this is in poor shape then it will show up in a hard and clunky ride over bumps and pot-holes and may be accompanied by a clunk from the base of the suspension unit (directly below your bum). Noise - many newcomers to the Deauville comment on how noisy it is from the rider's seat. Like many faired motorcycles, the fairing panels amplify the noise from the engine. Some helmets amplify this noise further. Riding with ear plugs is recommended, so have some on you for the test ride. Finding neutral - can be a problem when coming to a halt when the engine and transmission is fully warmed up. This is normal and will be overcome with practice. Starting - Make sure the engine turns over at a good pace and that the engine is not reluctant to start. If not, suspect the battery. Engine idle - should be around 1200 rpm on the 650, slightly more on the 700. The ride - should be uneventful. The weight that is obvious when pushing the bike around disappears above walking pace. The engine should be smooth in both pick-up and roll-on/roll-off, and it should pull from just above idle. On the 650 there is a noticeable (but not pronounced) step up in performance, through to around 7,000 rpm. Taking it above 7,500 rpm is a bit pointless and noisey. Steering - should be smooth at all times. Any clunking of the bars could indicate worn steering head bearing. Some vibration will be present through the grips and this is normal provided it is not excessive, and the worst vibration patch is usually around 70mph which will either act as a reminder of the UK's upper speed limit or encourage more enthusiastic riding, depending on the rider's preferences. Any jarring or shuddering felt through the bars when riding on poor road surfaces or over pot-holes could indicate the need to change the front fork oil. Handling - if the tyres are in good condition the handling should be predicatable and sure footed with virtually no tramlining or wandering on the road. Feeling through the bars will vary depending on the screen and make/model of tyres fitted. With a standard or low screen and modern tyres fitted the front end is very slightly "lively" - nothing like a sports bike but no where near as heavy as on a Deauville with a tall touring screen. However, having now ridden a number of 650 Deavilles, I can say that each one is different with tyres and screens making the biggest difference. Overall - the Deauville is never going to handle or accelerate like a sports bike, but having said that, it has adequated performance and is never going to scare the rider who will always be (and feel) in control. Nobody has ever high sided a Deaville. It's not the sort of bike that the "wheelie & stoppies" brigade will ever ride. Because it is simple to restrict/de-restrict to meet the 33bhp learner rider laws it is popular with all ages of rider, but, mainly those returning to motorcycling and the mature riser. 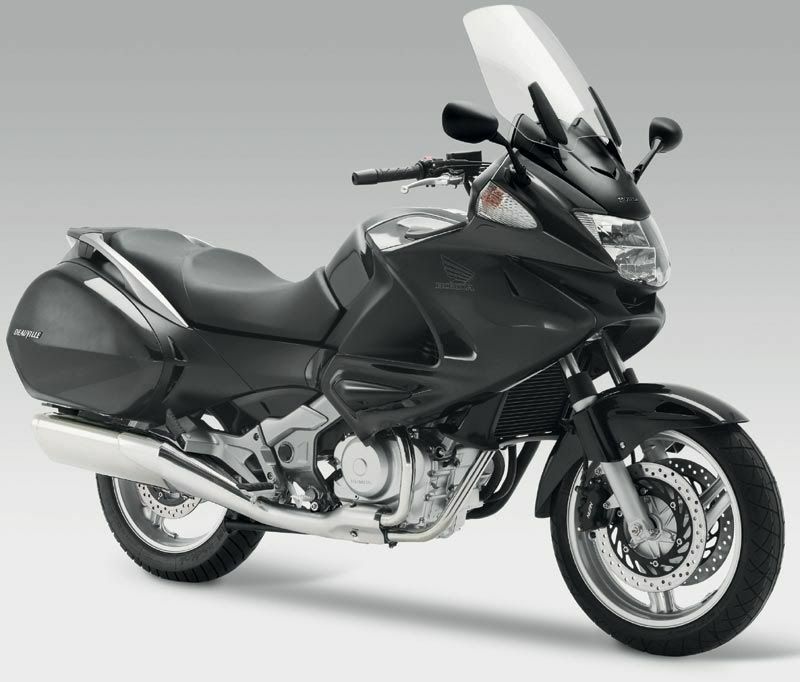 Because it is comfortable over long distances and for long stint in the saddle it gets used for commuting and touring. Most riders should return in the order of 55mpg in normal use although surprisingly the 650 consistently returns a couple of mpg more than the 700. - and gently pulling back with your left hand. There, easy once you know how. 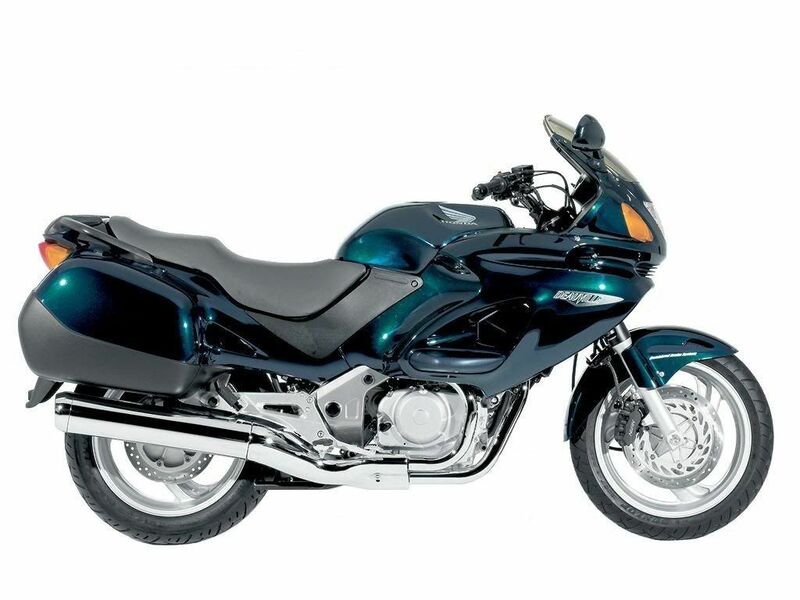 Now all you have to do is decide whether the Deauville is the bike you want. If not, then walk away. If it is, then now is where you start to take your time, so get rid of the sales person (ask them for some thinking/breathing time and/or a cuppa). - identify the accessories you require that aren't fitted. Oh! Finally, make sure you will get 2 keys, both with the HISS transponders in so that you can start the bike. Honda dealers want around £85 to supply, cut and code a replacement key, not cheap. - get those accessories fitted and included in the advertised price.